There are fewer things I enjoy in life more than a delicious peanut sauce. You see, I started experimenting with different ethnic cuisines a bit later in life than most. It wasn’t until I was 25 years old that I first tasted peanut sauce, but I fell in love immediately. I would compare it to the first time Michael Jordon picked up a basketball. We were meant to be. During my 2 years in San Francisco I had some of the best Thai food, and since moving to Philadelphia and starting a keto diet I haven’t been able to enjoy my all time favorite dipping sauce. 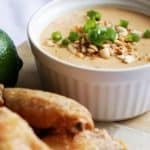 That is, until I got into the kitchen late one night and whipped up this sensational Low Carb Peanut Sauce! Not only is this thai peanut sauce low carb, but it’s also low effort! There is no cooking required. You basically just throw everything in a blender and turn it on, and what comes out is a delicious sauce suitable for bathing just about every food in your house in it. Peanut chicken anyone? There’s a few variable to play with here that can vary from person to person. The first being the sweetness. We go for 10 drops of stevia in here, but turn that up or down as you see fit. 10 drops is not as sweet as most sauces you’ll get when ordering take out. That would be closer to 20 drops. Conversely, you can turn this into a spicy peanut sauce if you’d like by adding some chilis! Next up is the oiliness and fat content. We use a natural peanut butter that is on the oily side. If you use a peanut butter that is thicker, like the JIF/Skippy type of peanut butter, you’re going to want to add about 1 tbsp of additional oil. I’d recommend sesame oil, but any oil will do. The name of the kitchen appliance you’ll be preparing this in and also my NBA Street character that made it all the way to Rucker Park and eventually the NBA. He was a crafty point guard with a silky jumper that could also throw down like Vince Carter. Because why wouldn’t he be? You’ll want to consider the blade clearance on your blender for this. The volume of sauce for this recipe comes out to around 1 cup, so if 1 cup of liquid doesn’t reach your blender blade you will be left with a sad partially mixed peanut sauce underneath your blade. It happened to us… You can either double the recipe or if you have something like a magic bullet style blender it should work fine. This sauce pairs perfectly with our crispy chicken wing recipes, as well as our keto pad that! Add all the ingredients listed to your blender along with half of the water listed and blend for 30 seconds. Check the consistency. If it needs to be thinner add more water. Repeat this process until the sauce is the thickness you desire. Top with chopped peanuts and green onion. Serve and enjoy!